Every year, Quench profiles Canadian chefs who are contributing that elusive something to the food scene, helping to change it, helping it to evolve. This year’s lineup is (often unintentionally) helping to define Canadian cuisine, which is no mean feat. Dan Vorstermans at The Highwayman puts a Spanish twist on Halifax’s favourite export, seafood. For someone whose career in the kitchen started by answering a help-wanted ad on Kijiji, Chef Dan Vorstermans has carved out a solid place for himself in Nova Scotia. His six-month stint at that first restaurant inspired him to become a chef. In 2010, he moved to Halifax to study culinary arts at Nova Scotia Community College while working at Chives. 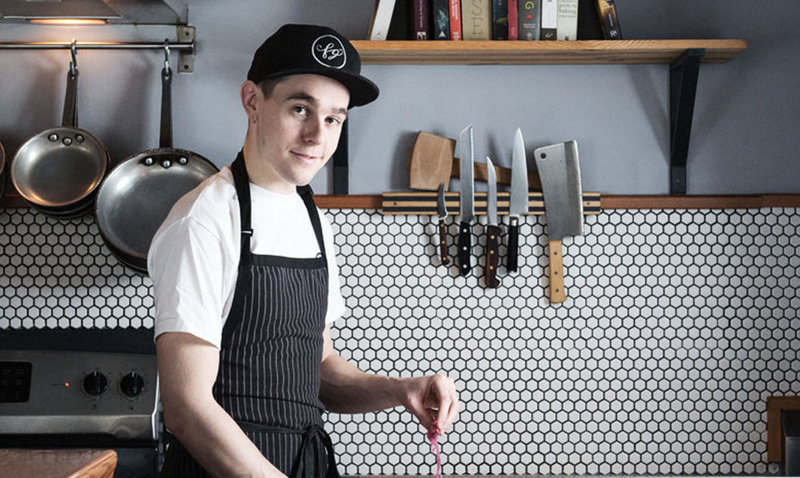 After gaining experience as sous chef at Morris East, he and his wife, Ceilidh Sutherland, opened Field Guide in 2013. This first foray into restaurant ownership gave him the creative bug and, in 2016, he, his wife and business partners Adam MacLeod and Michael Hopper opened The Highwayman. At The Highwayman, Vorstermans focuses on Spanish food — fresh fish, cured meats, pintxos — a culinary style that works well with the natural produce and ingredients found in Nova Scotia. I love that cooking is always different. I never liked the sciences or math when I was in school because there was a rule for everything; there wasn’t much room for interpretation. When you’re cooking, especially in a restaurant, you’re constantly making decisions on the fly, making changes and adjustments to get things just right. No two days are ever the same, which can get exhausting, but it’s exhilarating at the same time. What is the biggest influence on your cooking style and why? Currently my biggest influence is Spanish cuisine. I love the simplicity and focus on quality ingredients in Spanish cuisine. When you keep things simple, the focus can be on having a good time with friends and family. With the exception of “modern Spanish cuisine,” it’s not about complex cooking techniques or overly complicated dishes, it’s just about sitting down and eating really flavourful food. What challenges have you faced fusing together Spanish cuisine and Nova Scotian ingredients? Nova Scotia is a very small province, and therefore we don’t have a ton of purchasing power. Unfortunately, this means that a lot of things — seafood in particular — gets shipped to other markets before we can even get our hands on them here at home. It sounds crazy, but my biggest struggle on a day-to-day basis is getting good-quality, fresh seafood for our restaurant. Luckily, there are a couple people working really hard to change this, but there’s still a long way to go. Why is it important to you to use locally sourced ingredients? It comes down to quality and taste. It’s no secret that the freshest, most ripe, most delicious produce is the stuff that comes from a small farm that’s close by. To get back to my earlier point, Spanish food is interesting to me mostly because of the overall mentality behind it. If we were importing every bit of meat or produce, it wouldn’t be true to the “essence” (for lack of a less cheesy term) of Spanish food. Speaking of “essence” — in your opinion, what is the essence of Canadian cuisine? I don’t know if there is an “essence of Canadian cuisine.” We have so much regional diversity, plus the diversity brought by immigrants. All that added to the fact that Canada is such a gigantic country with so many different agricultural regions, and the diversity of things like fish species from coast to coast, makes it difficult to pick one unifying aspect to all of it. I think that all this makes Canada a really interesting place to be making food, though, because there aren’t such strict traditions or expectations that you might get in a country like France or Japan. You have open-concept kitchens in both your restaurants. What is it about the open concept that you like and why do you incorporate it into your restaurants? It’s essentially about visibility, both for the guest and the staff. Guests benefit from an open kitchen because they can see what’s going on: the product you’re working with, the way the cooks are acting, the cleanliness of the kitchen, etc. It’s nice for the staff, too, because they can see what’s going on in the dining room, and they become part of the whole restaurant experience — they’re not just behind the scenes. How does your drinks menu play into/complement the food you serve at The Highwayman? Our wine list is mainly Spanish and Spanish-style wines, which is a no brainer. Our sommelier Nicole does an amazing job. We also have a great list of sherries and amari, both of which are just catching on in Halifax. The cocktail scene here has been growing a lot over the last few years (since we opened Field Guide). So, with Highwayman, we wanted to introduce people to something new. We do also have a great cocktail menu, and a gin and tonic menu with a selection of about 10 different gins with complimentary garnishes (the G&T is the unofficial drink of Spain). Why did you guys choose The Highwayman poem as your inspiration and how does it shape what you do with the menu/service/brand/direction at The Highwayman? We chose Highwayman mostly because we just liked the name and the imagery that it provokes: sort of dark and moody, elegant but not “fancy.” It inspired our branding and the design of the restaurant a lot. There’s a lot of imagery in the poem — talk of fabrics, colours, textures — and things that we used to inspire the design of the restaurant. Something like a roast chicken, or lasagna. Something hearty and warm and that takes a long time to make. It’s fun to spend a couple hours in the kitchen when it’s cold and rainy. Trim any large leaves off the cauliflower, then cut into quarters. Toss with enough oil to coat the outside and sprinkle generously with salt. Place the quarters flat side down in a covered roasting pan or a large Dutch oven. Roast for 30 to 40 minutes or until the thickest part of the stem is almost completely cooked through. Toast the almonds at the same time for 10 to 15 minutes, or until they are nicely browned. Meanwhile, trim off the radish tops and wash them very well. Chop the radish tops as finely as you can. Add half of the toasted almonds and the garlic and chop them into the radish tops until there are no large pieces. Grate the Idiazabal with a microplane and mix it all together in a bowl. Season with salt and add enough olive oil to make a loose pesto. Slice the radishes as thinly as possible, using a mandoline if you have one. Roughly chop the remaining almonds. To serve, char the cauliflower on all sides in a very hot cast iron pan with a bit of oil, or on the barbecue. Arrange the cauliflower with the cut sides facing up on a large platter. Spoon the pesto overtop, then top with the almonds, radish slices and the anchovies.